To Tweet or Not To Tweet During a Disaster? Yes, only a small percentage of tweets generated during a disaster are directly relevant and informative for disaster response. 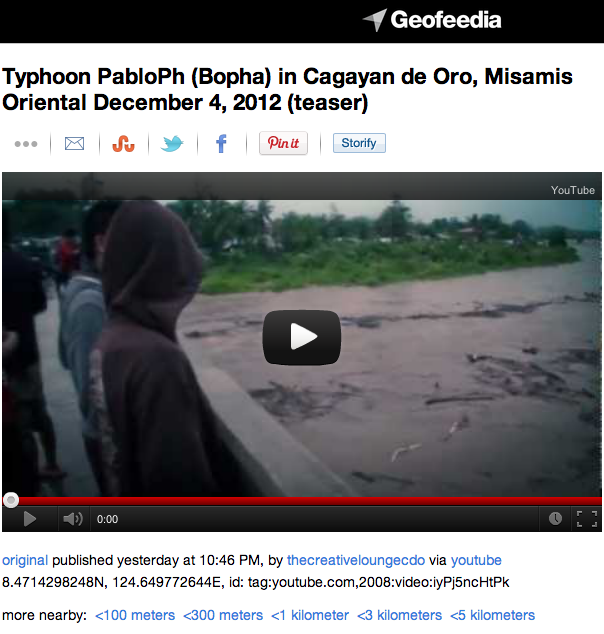 No, this doesn’t mean we should dismiss Twitter as a source for timely, disaster-related information. Why? Because our efforts ought to focus on how that small percentage of informative tweets can be increased. What incentives or policies can be put in place? 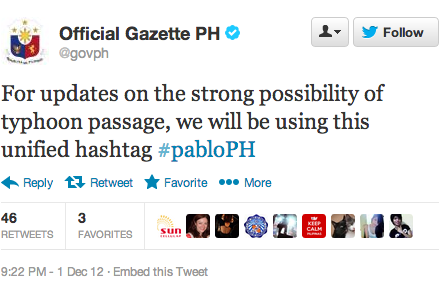 The following tweets by the Filipino government may shed some light. 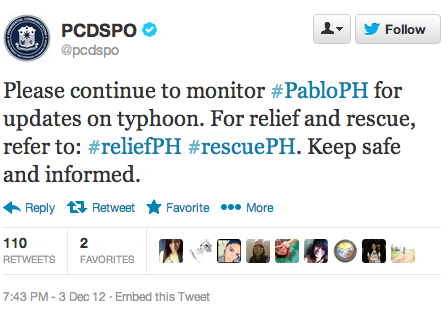 The above tweet was posted three days before Typhoon Bopha (designated Pablo locally) made landfall in the Philippines. 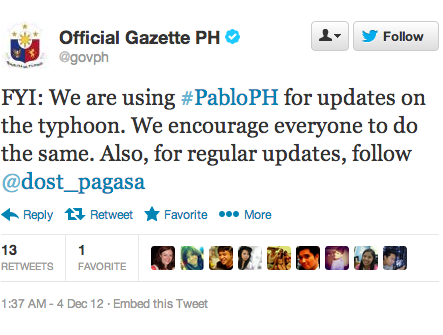 In the tweet below, the government directly and publicly encourages Filipinos to use the #PabloPH hashtag and to follow the Philippine Atmospheric, Geophysical & Astronomical Services Admin-istration (PAGASA) twitter feed, @dost_pagasa, which has over 400,000 follow-ers and also links to this official Facebook page. The government’s official Twitter handle (@govph) is also retweeting tweets posted by The Presidential Communications Development and Strategic Plan-ning Office (@PCDCSO). This office is the “chief message-crafting body of the Office of the President.” In one such retweet (below), the office encourages those on Twitter to use different hashtags for different purposes (relief vs rescue). This mimics the use of official emergency numbers for different needs, e.g., police, fire, Ambulance, etc. Given this kind of enlightened disaster response leadership, one would certainly expect that the quality of tweets received will be higher than without government endorsement. My team and I at QCRI are planning to analyze these tweets to de-termine whether or not this is the case. In the meantime, I expect we’ll see more examples of self-organized disaster response efforts using these hashtags, as per the earlier floods in August, which I blogged about here: Crowdsourcing Crisis Response following the Philippine Floods. This tech-savvy self-organization dynamic is important since the government itself may be unable to follow up on every tweeted request.